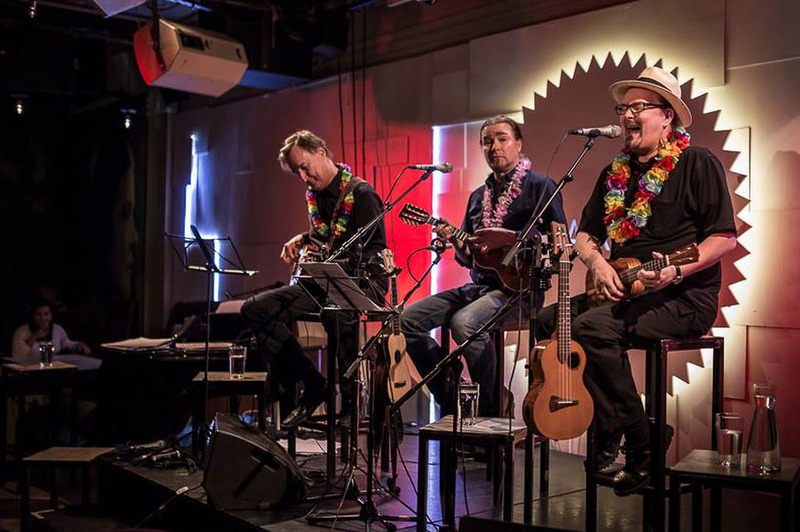 UkEt is a hard-strummin’ ukulele trio from Southern Finland. Although the band is relatively new, formed in 2012, it’s members are hard-boiled music-professionals. Put together they bring some 80 years of experience on all sorts and sized of stages, from small local venues to large international festivals. Master of strings and wizard of licks. Timo is known for his fast and innovative playing techniques, strongly inspired and influenced by his years of playing traditional Russian stringed instruments. When UkEt are performing as a trio without a guest-percussionist/drummer, he is also in charge of the on-stage rhythm section. Tallest member of the band who plays the lowest tones. Turkka has a long history in the Finnish music scene and has played with a number of local legends. His old-school bass-picking forms a rock-solid foundation for the UkEt sound. Gear: Custom shop G-String Concert by James Makaio, taropatch by Claus Mohri, Kasha tenor by Shane Highway, Old-skool Ovation Soprano, pimped & modified Recording King lapsteel, 6-String CB by Hans Thüring and a lot more!!! Juha is a veteran of the European ukulele-scene and internationally recognized ukulele-aficionado, producer, writer, instructor and player. Although his style of playing is strongly influenced by classical music, old-time jazz, folk, Cajun and traditional Hawaiian styles, he is often seen on stage with a range of highly technical and modern sound shaping solutions. Enter your email address to follow UkEt and receive notifications of new posts by email.